It's A Dan's World: NOW THAT'S A SPLASH PAGE: Merry Christmas People! NOW THAT'S A SPLASH PAGE: Merry Christmas People! Splash pages, you gotta' love 'em. A blank canvas where the artist can hit the reader with a large dose of illustrated 'wow'. 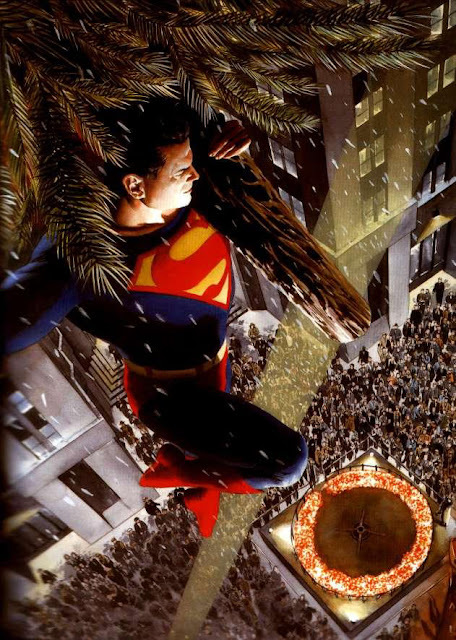 This week a festive Superman, by the always awesome Alex Ross. A bit of a cheat in that this is a word free version of how the image appears in Superman: Peace On Earth - but I couldn't have any one other than the big 'S' on the Christmas Day post. Christmas is Superman. It's a day where random strangers wish each other well, and when news bulletins are (shock horror) generally positive. Watch a Christopher Reeve Superman film if you find yourself still awake late at night, full of Christmas kai (food). Watch it and tell me if Superman and Christmas just doesn't feel right. Believe me - on this of all days - there is just something in the air. Alex Ross's artwork is perfect as always. The city looks like a scene out of an old black and white movie from the '40's and in my opinion fits Superman just as well as the art deco retro 40's look fit the Batman Animated series. Happy Holidays to you too Dan. Thanks for keeping all of us entertained all year. I agree Craig..Alex Ross is a living legend.Artwork is a masterpiece. You are right - the piece is stunning. I'm not a guy to sit still, but if I do find myself getting restless, I often chuck on the old Superman Fleischer cartoons. Alex Ross's Superman seems to lean on that a bit, which is brilliant as they and he really do capture the Superman spirit. Man, did LOVE those oversized Dini/Ross books. Good choice. Alex Ross is always a good choice. And I hope Xmas was good for you and I wish also an excellent 2011 to you and this blog. A hug. I agree completely about the Max Fleisher cartoons. Ross definitely seemed to channeled them, and that is why his Superman has become the iconic vision of the Man in Blue for our age. Superman always brings Peace back to Earth. Merry Christmas! Merry Christmas to you both to Randon and João! Glad you both liked the choice and hope you had a great holiday season!